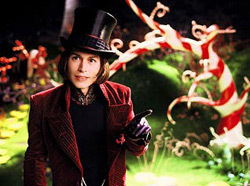 The playfully warped imagination of director Tim Burton is ideally suited to the task of bringing Roald Dahl's twisted-as-taffy children's tale "Charlie and the Chocolate Factory" to the big screen, and the sourball confection created as a result is pure movie magic. It's so enthralling in spirit that an audible gasp of joy rose from a sneak preview audience Monday night when -- even though this is a given point of the plot -- impoverished, good-hearted little Charlie Bucket (the gifted Freddie Highmore) unwrapped his Willy Wonka chocolate bar and found one of five sparklingly golden tickets to tour the towering titular candy plant. Inside the mysterious factory, Burton brings delicious and Technicolor-bright life to Dahl's visions of chocolate rivers (I sense a theme park ride in our future), everlasting gobstoppers, magic glass elevators and Oompa Loompas, Wonka's staff of uncanny munchkins (all played by a small, amusingly stoic actor named Deep Roy, who is made even smaller through CGI effects). He also delights in dispatching Dahl's infamous quartet of other ticket winners -- spoiled brats with eerily plasticized faces who soon fall victim to various candy-making contraptions amusingly befitting their particular disciplinary problems. But the film gets much of its off-kilter energy from Johnny Depp's creation of a daffy, benignly sinister Willy Wonka who is prone to flashbacks of a Burtonesque childhood (a new concoction in the excellent screenplay by John August) featuring a strict, anti-candy dentist for a father (Christopher Lee) and a face wrapped in humorously horrifying orthodontia. "I'm sorry," Wonka says with chirpy, unsettled embarrassment after snapping out of one of these episodes, "I was having a flashback." Decked out in a plum velvet evening coat, purple surgical gloves and a top hat resting on a doll's-head pageboy trim, Depp (working with Burton for the delirious fifth time) takes the character in a more psychotically childlike (and possibly Ritalin-addled) direction than Gene Wilder did with his sly, subversively sharp-witted title character from 1971's "Willy Wonka and the Chocolate Factory." As a result (and despite the title) this film ends up being far more about weird, whacked-out Willy Wonka than sweet, altruistic Charlie. But 12-year-old Highmore (recommended to Burton by Depp after working with the boy in "Finding Neverland") holds his own with such ingenuous sweetness that he commands the movie's point of view. Even before we step inside Wonka's wonderland with Charlie and his grandfather (craggy, fragile, lovable David Kelly), Burton has already created an eccentric and enveloping world, full of resonant little touches of atmosphere, in which Charlie's extended family (including mom Helena Bonham Carter and dad Noah Taylor) occupies a slanty shanty in the shadow of Wonka's factory. And while "Charlie and the Chocolate Factory" has its imperfections (why does Burton always let composer Danny Elfman run roughshod over the soundtrack? ), its spell isn't broken for even a second until the closing credits roll.